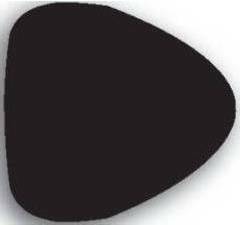 Comfort-Gel Pad.3/4" thick visco-elastic gel. Cover is black spandura or simulated sheepskin top with a nonskid vinyl bottom.1" wide black nylon / velcro attachment strap. 10" long, 7" to 13" wide. Bare gel $55 (XL), spandura $60, sheepoidskin $70. The bare gel pad should be placed into your seat under the upholstery. You would cut out some space for it from the foam, then trim the gel pad to fit. 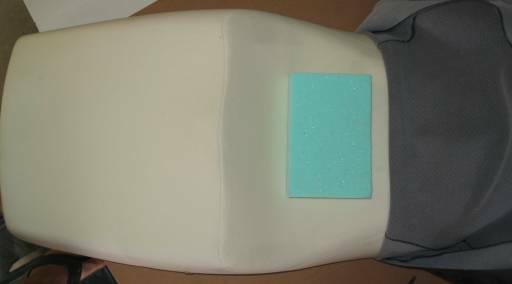 Large Cruiser Seat Pad(16inL x 14inW) Medical Gel pad with Memory Foam and a lycra no-slip cover. $120. 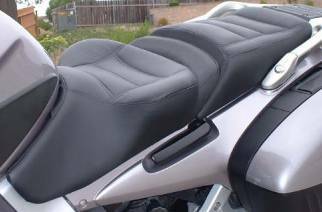 Air Hawk air adjustable seat cushion.Black removable washable cover has a nylon/lycra top and a nonskid polyester/vinyl base. 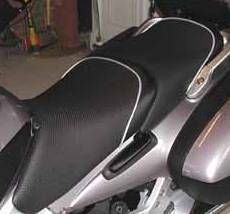 Multiple neoprene rubber air cells.Cushion fits on your motorcycle seat (inflated, it raises you less than 1/2" from seat). Inflates to approximately 1/2" thick. $195. Suzuki sells upgraded seats for most of their bikes. I've owned a couple of these, they're not bad and relatively inexpensive. 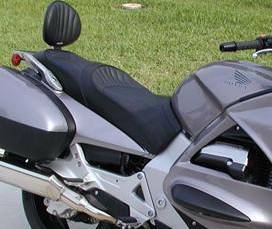 Check on the Suzuki Accessories page. I believe these seats are made by Travelcade. I also believe in the Easter Bunny, Santa Claus, and the Basic Goodness of Mankind, so you may take my beliefs as you will. Travelcade will add a gel pad to your stock seat for $125. No visual differences. 800-397-7709. For about another $125, they'll add a heater element. 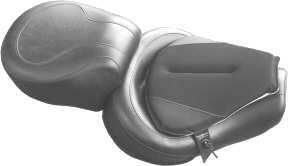 Sargent World Sport Seat - two piece, adjustable, built-in storage compartments. Comes with new seat pans. $620. Melvin Hunter Seats. UK: £200. 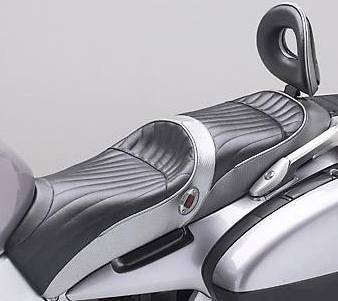 Corbin seat - heated, one piece, no adjustability. 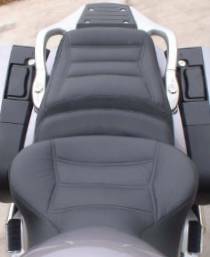 About $600 + $200 for backrest. Photo by John Mueller. Corbin seats are love 'em or hate 'em, about a 50-50 proposition. Corbin has had serious legal problems, and apparently is back at it again. You might consider a different manufacturer. Rich's Custom Seats - about $750 in leather. Rich's Cycle Upholstery - about $200 in vinyl. 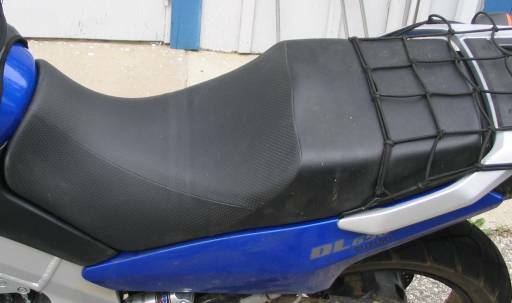 Russell Seat - about $550 - 700. Bill Mayer invented this seat, and sold the patent and rights to Russell. This seat has internal springs like a mattress. If you weight more than 250 pounds, you have no choice: this is the only saddle that will work for you. Rocky Mayer Custom Seats. $360 for the front, $420 for front+rear, +$150 for leather. Rocky Mayer is the other of Bill Mayer's sons. Not to be confused with Rick Mayer, who is infamous for stealing seat, cash, and not finishing products. Photo by Vernon Danielson. Modify your seat for extra comfort. 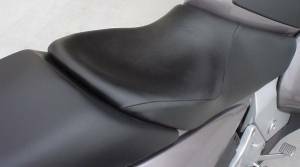 These pictures are of a Suzuki DL650 seat. 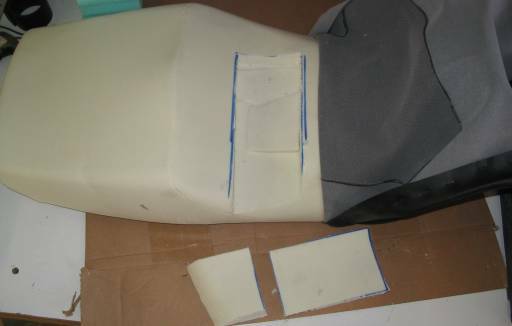 The basic instructions will work on any bike which has a flat seat (no sculpting), and fairly dense foam. You can repeat this process for your passenger seat, also. This is not a case where more is better - the tempur foam is non-supportave in this thickness, it's to relieve pressure. A seat made only of tempur foam needs to be at least 3" thick. What we're going to do is cut out a rectangular section of foam away and replace it with high-density hospital quality tempurfoam. Tempur foam, also called memory foam, was invented by NASA to improve comfort during liftoff and for fighter pilots. The tempur foam will slowly mold itself to your shape, forming a perfect custom fit. After you get off the seat, in 2-4 minutes the foam will come back to its original shape. The result is that the pressure is spread very evenly, with no pressure points on your hip bones. If you have trouble finding suitable foam, we sell pieces. You can click to buy them at the end of this page. 1 piece Tempur Foam, 6" x 4" x 1". Electric knife. $10 at Target for a Toastmaster. 3M Super 77 spray adhesive. About $5. Heavy-Duty staple gun. I recommend the Stanley Power Sharp Shooter. About $12. Remove the seat from the motorcycle. Remove the original cover from the seat base, plate or pan. With a screwdriver first pry up each staple, then remove it. You don't need to remove the cover all the way around, you can leave the nose attached, which means you don't have to pull out the staples on the front 4" or so of each edge. Center your piece of Tempur foam (green above) in the seat, with the back edge of the tempur foam against the portion of the seat the raises up in the rear. Trace around the Tempur foam with the felt tip pen. Set the piece of Tempur foam aside. Using the yardstick as a guide, extend the front and rear lines across the width of the seat. Using your electric knife, make a cut along the forward edge about one inch deep, and extend the cut all the way to one edge of the seat. Now make a cut about one inch deep along the trailing edge, and extend this cut to one edge of the seat. Finally, make cuts about one inch deep along the left and right edges of the Tempur foam trace. Remember, your marks were on the outside of the Tempur foam, so your cuts should be just inside of your marks. Now with the electric knife turned off, sink the blade into the cut on the trailing edge to a depth of one inch. Turn the knife on its side so that the cutting edge of the blade is pointing forwards. Turn the knife on and move it forwards, cutting a rectangular slab out of your seat which is four inches front to rear, one inch deep, and extends from the left edge of the Tempur foam to the right edge of the seat. The foam you cutout will come out in two pieces, as shown above. One piece will be 4" x 6" x 1", and the other piece will be 4" x 1", and one side of this piece will match up with the side of the seat. Now we're going to re-attach the strange shaped piece we just cut out, leaving a hole in the seat which is 6" x 4" x 1".Spray some adhesive onto the seat where the strange shaped piece fits. Hit the base and the two edges. Spray some adhesive onto the piece itself, hitting the bottom and the two edges. Push the piece into place. Now we're going to insert the Tempur foam. Spray some adhesive onto the seat, and onto the Tempur foam. 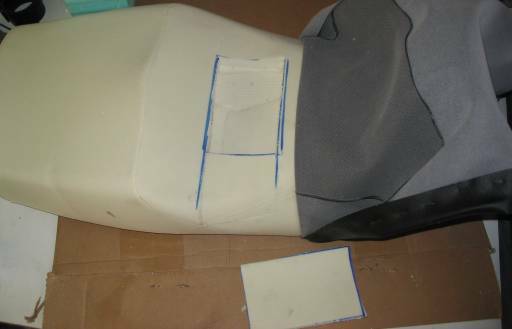 The Tempur foam will be held into place by the normal seat foam and the seat cover - we really don't need any adhesive here at all, but we're obsessive about our motorcycles, right? This is the finished foam seen from the side. On my seat, as you can see, the Tempur foam was not a perfect fit.Because of the shape of the seat, the Tempur form sticks up about 1/8" in a few places. This cannot be felt when you're on the bike, as the Tempur foam reshapes itself to fit you. It also can't be seen, as the seat cover hides these small imperfections. Turn the seat over (foam side down). 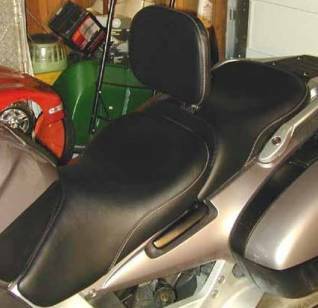 With firm, even pressure, pull the seat cover tight and install a few staples in each side. Turn seat back over and make sure that the seat cover is straight. Make any adjustments by removing staples and re-installing staples if necessary. 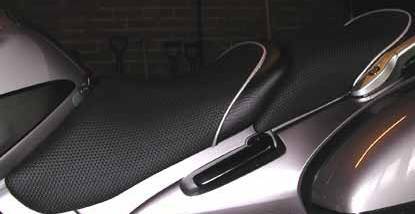 Continue working your way around the seat by applying even pressure and installing staples two inches apart.Periodically turn the seat cover over and check for straightness until entire seat cover is securely installed. This is a temporary attachment of the seat cover, we're not done. Now put in more staples so that there's a staple every ½ to 1 inch (1 to 2cm). Here's the finished seat back on the bike. You can see a couple parallel folds in the seat cover - this is from when I had the seat cover pulled back for a half hour as I did the work and took these pictures. Those creases are gone now, they disappeared in about 15 minutes. You can't see that my seat is other than stock, but you can feel the difference. 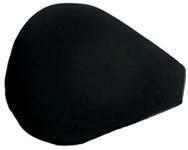 We stock tempur foam pieces 6" x 4" x 1" in firm and extra-firm. We recommend extra firm if you weigh over 155 poumds, 70 kilos. You can get two pieces if you would also like to do your passenger seat.